"It was great to see a full page dedicated to Ohmynews in your recent issue (NMA 05.10.06). 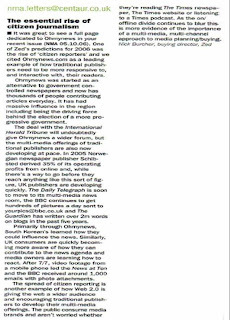 One of Zed's predictions for 2006 was the rise of 'citizen reporters' and we cited Ohmynews.com as a leading example of how traditional publishers need to be more responsive to, and interactive with, their readers. Ohmynews was started as an alternative to government controlled newspapers and now has thousands of people contributing articles everyday. It has had massive influence in the region including being the driving force behind the election of a more progressive government. The deal with the International Herald Tribune will undoubtedly give Ohmynews a wider forum, but the multi-media offerings of traditional publishers are also now developing at pace. In 2005 Norwegian newspaper publisher Schibsted derived 35% of its operating profits from online and, while there's a way to go before they reach anything like this sort of figure, UK publishers are developing quickly. The Daily Telegraph is soon to move to its multi-media news room, the BBC continues to get hundreds of pictures a day sent to yourpics@bbc.co.uk and The Guardian has written over 2m words on blogs in the past five years. Primarily through Ohmynews, South Korean's learned how they could influence the news. Similarly, UK consumers are quickly becoming more aware of how they can contribute to the news agenda and media owners are learning how to react. After 7/7, video footage from a mobile phone led the News at Ten and the BBC received around 1,000 emails with photo attachments. The spread of citizen reporting is another example of how Web 2.0 is giving the web a wider audience and encouraging traditional publishers to develop their multi-media offerings. The public consume media brands and aren't worried whether they're reading The Times newspaper, The Times website or listening to a Times podcast. As the on/ offline divide continues to blur this is more evidence of the importance of a multi-media, multi-channel approach to media planning/buying. Nick Burcher, buying director, Zed"